I have an unhealthy obsession with the Dodgers of my youth. They were the guys who made me fall in love with the team, and they will forever be fondly remembered. Heck, there has always been a little pain in my heart when I see one of our own put on another teams uniform, but such is life. After all, I couldn't rightfully expect so many great Baseball minds to stay in LA. There just isn't enough room for them all to stay. So, as many of those old horses have graduated beyond playing on the field, it shouldn't have been a surprise to see so many hear the call to be the skipper. I'm constantly amazed by how many former Dodgers from the 70's and 80's have gone on to manage or coach, and considering their mentor I guess I shouldn't be surprised in the least. 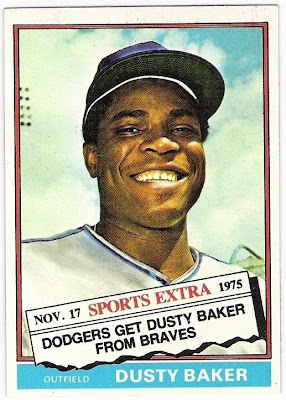 One of those old Dodgers to rise up as manager is Dusty Baker. While in Chicago on Wednesday, Reds manager Dusty Baker was admitted to Northwestern Memorial Hospital and diagnosed with atrial fibrillation, commonly referred to as an irregular heartbeat. As he was being discharged on Friday, he suffered a mini-stroke and immediately was treated by the hospital's stroke team, which minimized the effects of the stroke. Dusty returned to Cincinnati on Sunday, and his condition has improved dramatically. His Cincinnati neurologist, Dr. Joseph Broderick, and cardiologists, Dr. Dean Kereiakes and Dr. Daniel Beyerbach, expect Dusty to make a full recovery and return to the dugout, possibly as soon as the season's final series next week in St. Louis. Dusty said, "While at Wrigley Field I was blessed to have our trainer, Paul Lessard, have the good sense to call in Cubs team physician Dr. Stephen Adams, who examined me in the clubhouse, immediately determined how serious by condition was and personally rushed me to Northwestern Memorial Hospital. Dr. Broderick and Dr. Kereiakes are going to make sure I'm ready to handle the duties of managing before I return full time. My family and I are very grateful for the support we've received the past few days from Mr. Castellini and our ownership group, Walt, our friends, the baseball family and especially Reds fans. I'm feeling much better, and it's great being back here in Cincinnati. Chris Speier and my staff are doing a terrific job, and I look forward to getting back to the dugout." Thank goodness for some quick thinking and modern science. Get Well, Dusty! This old Dodger fan looks forward to rooting for your Reds when you come back. This is assuming, of course, that the Dodgers don't make it to the postseason- then, all bets are off. Look at what just popped up on eBay. Featured above and below is the 2012 Matt Kemp Triple Threads Jumbo Sleeve Team Patch Relic card numbered "1 of 1". My Triple Threads obsession has not abated. It has a high asking price, but if you're interested I would suggest making an offer. Apparently, five folks have already done so. Jared Diamond at the Wall Street Journal rates which Baseball announcers are the biggest homers. Vin Scully is noted as being one of the more unbiased announcers. Say hello to a new Dodgers blog called Elysian Fields. I must confess that this was a name I considered for this blog some 6 to 7 years ago. Dustin Nosler of Feelin' Kinda Blue gets his question answered about Dodgers prospect Joc Pederson by Jim Callis of Baseball America. Here's your daily Canseco on twitter. Where does he get this stuff? Frank Jackson at the Hardball Times writes about the "Organizational Player" every team has in the minors. Ha! Ha! Ha! Unfortunately, only Kinks fans will laugh at this. Via Kuklas Korner, we find out that former Kings goalie and failure in the net Dan Cloutier has been named as a goaltending consultant for the Vancouver Canucks. Good luck with that. Watch some Navy Seals drop into Dodger Stadium. It's like I can't stop. 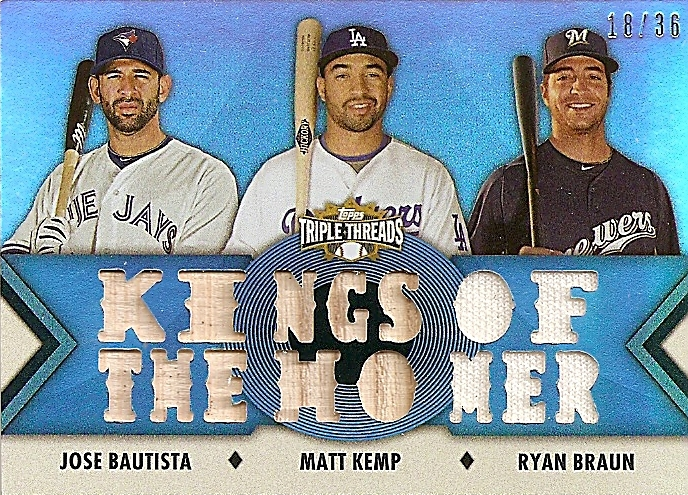 I've got a unhealthy obsession with this years Triple Threads cards, and I don't even plan on buying any. Well, not until I can grab them on the cheap. Following up on the heals of the base cards I've already posted, some other random relics and the Kershaw inserts cards are some of the Matt Kemp relic cards in the set. 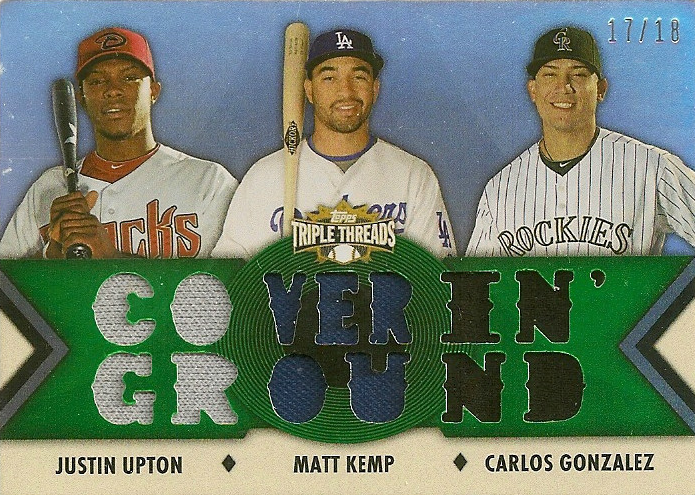 As I'm sure many of you already know, all Kemp autographed cards are not inserted into packs. Instead, there is a redemption card for his autographs. He has been notoriously slow at signing for Topps, so it will probably be a long wait for his autographed cards to appear. 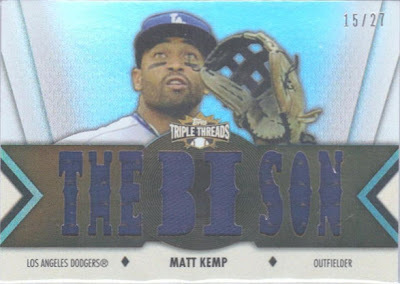 That being said, below are the Matt Kemp non-autographed relic cards from Triple Threads. 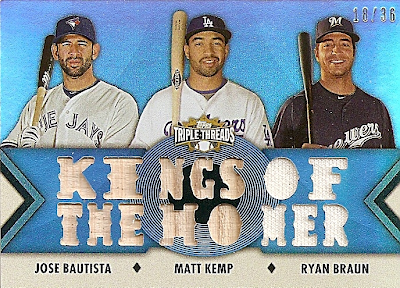 Below are the Triple Threads Relic cards. Each player has three different variations available. 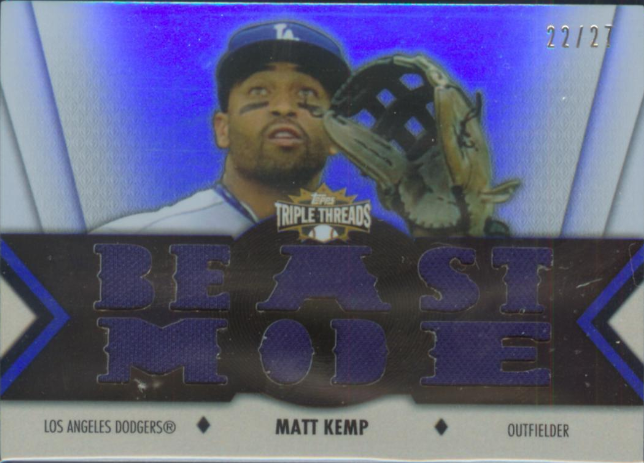 See all of the Kemp cards below. I love thinking about the past; especially when the present looks so bleak. 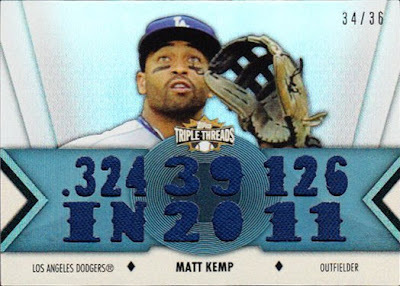 With the Dodgers trailing in the wild card standings by a seemingly insurmountable margin, I thought it might be fun to take a look back at a vintage game-used memorabilia item of a Dodger favorite. Maybe this is a way to beckon the spirits of the past to grace the current team with some Dodger magic. Currently available in this months MEARS auction is a 1976 Bicentennial All-Star game-used bat of Ron Cey. It features a great stamping of the Liberty Bell and a notation that this bat was made for the All-Star game. MEARS notes that it shows some use, but as you probably know Cey didn't get an at-bat during the game. 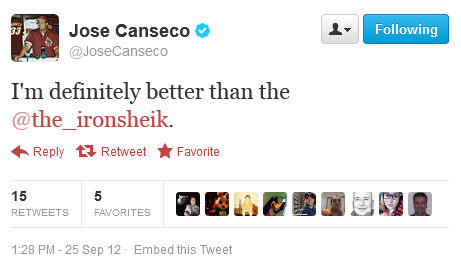 Instead, he came in as a defensive replacement in the 9th inning. Still, it may have been used during batting practice, or even during subsequent games in the season.